Quantum™ FITC-5 MESF | Polysciences Inc.
Quantum™ FITC-5 MESF kits include six microsphere populations that are ~7-9µm in diameter: one blank and five labeled with increasing amounts of fluorochrome. The assignment of fluorescence intensity in MESF units is performed through direct comparison of fluorescence measurements from solutions of the pure fluorochrome with those from microspheres surface-labeled with the same fluorochrome. 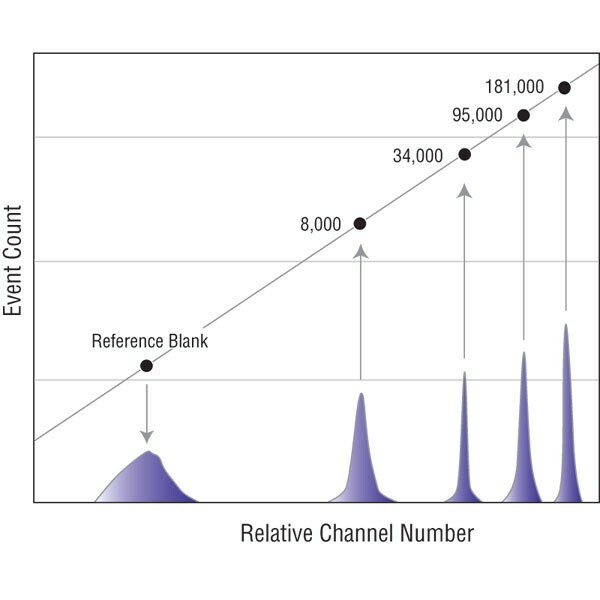 In addition to quantitative fluorescence cytometry, Quantum™ MESF kits may be used to assess the detection threshold, resolution, and linearity of the instrument. QuickCal® is provided with each kit to aid in determining the expression level of cells, and for evaluating instrument linearity and detection threshold. For more Flow Cytometry Resources, visit the Bangs Flow Blog.